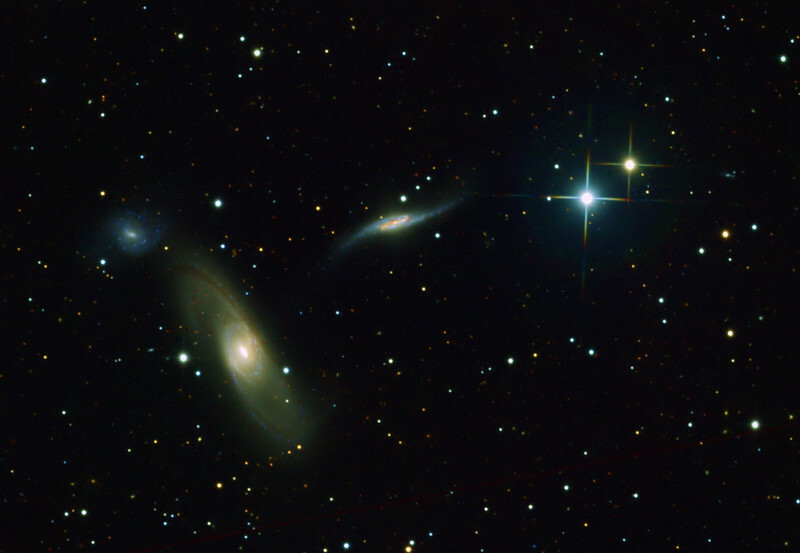 Progress report: 2 hrs each RGB on NGC 5566 and friends in Virgo. Cropped to 1/2 x 1/2 frame. Will need many more hours to do well. The big fella (orange, NGC 5566, mag 10.6 SB 13.3/sq arcmin) is causing intense star formation in small blue 5569 (mag 13.2, SB 14) at 10 o'clock from 5566, and extreme tidal disruption of 5560 (mag 12.4) at 2 o'clock. The brightest star in the image, SAO 160535, is catalogued as spectral class G2 and should therefore be neutral white but seems blue in most published photos.